Schoolgirl Style™ Twinkle Twinkle You’re a Star! 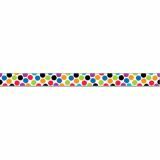 Simple, iconic binder clips are given a fresh look in this Binder Clips Border. Black and white polka dotted binder clips are accented with bright colors (red, yellow, purple, lime green, turquoise, orange, and blue) for a modern feel. Perfect for use on bulletin boards in a wide variety of classroom, office, church, and non-school settings. • 35 feet per package • 2¾" wide Border Idea: Add style and pops of color to any bulletin board by mixing, matching, and layering our solid and patterned bulletin board borders. This simple trimmer idea will make your bulletin boards really stand out! Borders are a simple way to add colorful style and to trim any bulletin board at a school, daycare, office, church, college dorm, employee break room, or at senior living residence. The Bold & Bright Calendar Set Bulletin Board features bold black and white contrasted by pops of bright colors. Stripes, dots, and spots combine with playful school supply accents such as binder clips, push pins, sticky notes, and corkboard to add color and texture to this modern look. This 67-piece calendar set includes a calendar chart, 12 month headlines, 31 pre-numbered calendar days, and 4 blank calendar days. The set also includes a days-of-the-week chart, a seasons and weather chart, and coordinating labels. The bright colors and modern design make this set perfect for children and adults of all ages. Bulletin board set also includes an instructional guide with bulletin board ideas, classroom activities, and a reproducible. Use this calendar bulletin board during your circle time or calendar time. 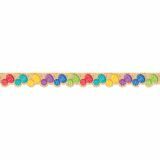 It is perfect for use on a bulletin board or on a magnetic whiteboard. The calendar days can also be used for various number activities in a learning center (e.g., number order; counting by 2s, 5s, 10s; and place value). 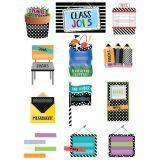 This Bold & Bright Class Jobs Mini Bulletin Board brings bold patterns and bright pops of color to your classroom jobs display. 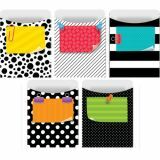 The Bold & Bright set features stripes, dots, and spots combined with playful school supply accents such as binder clips, push pins, and corkboard for a fun, modern look. 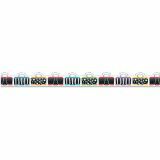 This 46-piece set includes 10 pre-labeled job pockets (Playground Equipment, Pencils, Chairs, Messenger, Pets, Doors, Line Leader, Papers, Supplies, Plants), 3 blank job pockets, and 32 student job sticks. Pre-cut slits on job cards make attaching names a breeze. Mini bulletin board set also includes an instructional guide with display ideas and classroom lesson activities. This classroom jobs chart bulletin board set is an easy way to keep the class organized and running smoothly. Students can quickly see which job they are assigned to, and each week teachers can easily switch students from one job to another. Class job charts can be displayed in a pocket chart, on a bulletin board, or on a magnetic whiteboard. This jobs chart is a classroom management must have! These Classroom Cafe 4" Designer Letters bring a modern flair to bulletin boards. These script-style punch out letters are white in the center with a thick black edging, making them highly visible from a distance. This package comes with 212 pieces, including upper and lowercase letters, punctuation marks, and numerals. Set also features social media symbols # and @. The simple, modern look of these punch-out letters makes them versatile for use on any bulletin board or display in a school, office, college dorm, senior living residence, dorm, church, or daycare center. Designer letters are ready to go for creating personalized headlines for bulletin boards, party signs, hallways, doors, classrooms, offices, and more! Use at home for student school projects, graduation signs, birthday banners, and other festive signs. Make a positive statement with the Bold & Bright Banner! This versatile 2-sided banner features a different message on each side—Side 1: "Welcome" and Side 2: "Make Way for a Great Day." It can be used during back-to-school to welcome students and parents then flipped over for a positive, inspirational message the rest of the school year. The colorful design and motivational messages make this banner perfect to use in so many places—the classroom, office, hallway, church, daycare, college dorm, and more! The fully assembled banner measures over 3 feet wide! Side 1 Design: "Welcome" spelled out on colorful pennants hanging on a green string. 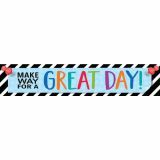 Side 2 Design: "Make Way for a Great Day" featuring a bold black and white striped background with colorful letters accented by blue polka dots and red push pins. 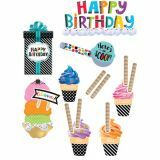 • 2-sided • 39" x 8"
Say Happy Birthday in Bold & Bright style with these colorful ice-cream cones! This 53-piece Happy Birthday Mini Bulletin Board includes 12 soft-serve ice-cream cones (each decorated with seasonal accents), 36 rolled wafers (student pieces), 1 Happy Birthday headline, 1 Happy Birthday present sign, 1 Here's the Scoop sign, 1 ice-cream sundae, and 1 Celebrate ice-cream sundae sign. The bold patterns and bright colors of these ice-cream cones are perfect for use with students of all ages. Display the eye-catching Happy Birthday! headline, the 12 month ice-cream cones, and the student wafer cookies as a year-long class birthday bulletin board. Have students use the data from the birthday display to create a class birthday graph. For smaller spaces, display the Happy Birthday! headline, the current month's ice-cream cone, and corresponding student wafer cookies. Use the blank present sign to write a birthday message to or post a photo of the birthday student. The colorful pieces in this set are great for use in a school, workplace, dormitory, or senior living residence. 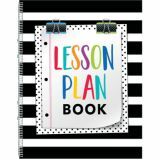 This Bold & Bright Lesson Plan Book offers 2-page lesson plan spreads for 40 weeks of teaching. 8 ½" x 11", spiral-bound. Bright colors and bold patterns combine to give these Bold & Bright Library Pockets a fresh and inspiring look. The fun design features a modern color palette with accents of cute sticky notes, push pins, and binder clips. Use these versatile library pockets to store paperwork, notes, or messages. They are handy for organizing game pieces, tracking checked-out library books, storing crafting items, and so much more! 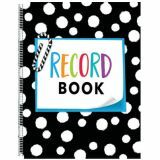 • 7 each of 5 designs • 35 library pockets per package • Standard Size: 3¼" x 4½"
This Bold & Bright Record Book will keep you organized and prepared. Spiral-bound, 8½" x 11". 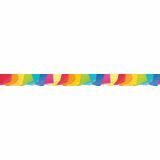 This versatile Sticky Notes Border features a rainbow of sticky notes all in a row—red, orange, yellow, lime green, turquoise, blue, pink, and light yellow. Each sticky note is patterned with polka dots or stripes to create a colorful, modern look. Perfect for use on bulletin boards in a wide variety of classroom, office, church, and non-school settings.